For manual seat: remove the front seat lh (see page se-11). For power seat: remove the front seat lh (see page se-27). Remove the bolt and yaw rate sensor bracket. 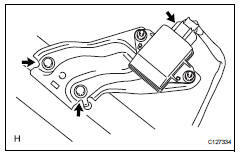 Disconnect the yaw rate sensor connector. Remove the 2 bolts and yaw rate sensor. Do not remove the sensor from the bracket. Inspect the yaw rate sensor. If any of the following occurs, replace the yaw rate sensor with a new one. Install the yaw rate sensor with the 2 bolts. Do not damage the yaw rate sensor. Make sure that the yaw rate sensor is installed securely. Connect the yaw rate sensor connector. Install the bracket with the bolt. 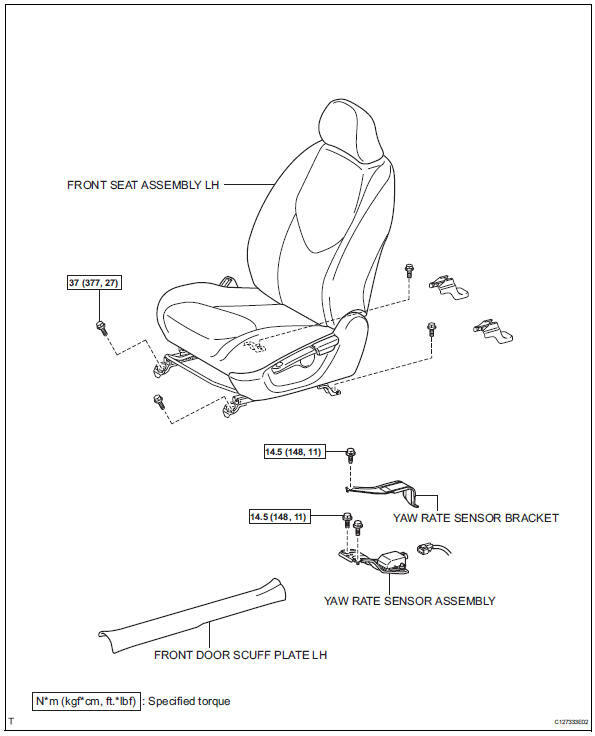 For manual seat: install the front seat (see page se-22). For power seat: install the front seat (see page se-37). Perform the yaw rate and deceleration sensor zero point calibration (see page bc-24). Inspect the yaw rate sensor signal (see page bc- 28).